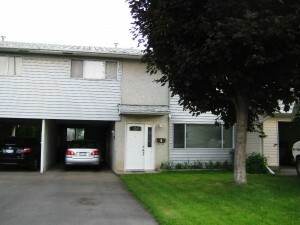 Spacious Brock townhouse with 4 bedrooms and 2 bathrooms, 2 car tandem carport and private yard. The 4th bedroom makes a great rec room! Many updates include furnace, hw tank, central a/c, appliances, front door, deck stairs and bathroom. There is laminate throughout and neutral colors. Located steps from transportation, schools and shopping.